Our off-the-shelf patch cord offering is extensive. Please feel free to refer to the chart below to get a quick feel for our on-line pricing. T568 A or T568 B Wiring Schemes- What's the Difference? Based on TIA/EIA-568-B.1-2001, the T568A and T568B wiring schemes define the pinout, or order of connections, for wires in eight-pin modular connector plugs and jacks. The only difference between T568A and T568B is that pairs 2 and 3 (orange and green) are swapped. Both configurations wire the pins "straight through", i.e., pins 1 through 8 on one end are connected to pins 1 through 8 on the other end, and the same sets of pins are paired in both configurations: pins 1 and 2 form a pair, as do 3 and 6, 4 and 5 and 7 and 8. 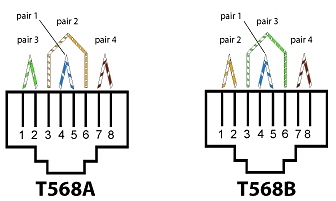 Cables that are terminated with differing standards on each end will not function normally, however mixing T568A-terminated patch cords with T568B-terminated horizontal cables (or the reverse) will not produce pinout problems in a facility, although it may slightly degrade signal quality, This effect is marginal and certainly no greater than that produced by mixing cable brands in-channel. T568 A or T568 B- Which One Should I Use? This specification applies to typical twisted pair network cabling including Category 5E (CAT5E) and Category 6 (CAT6). Click Here for a Full-Color Acrobat pdf file ( 412k ) - Right click to save it to disk. Please visit our Custom Cable Manufacturing area for an overview of our capabilities.